Hi all, here's my entry for the Computer Generated Lyrics Challenge, called 'Like A Hot Spoon'. 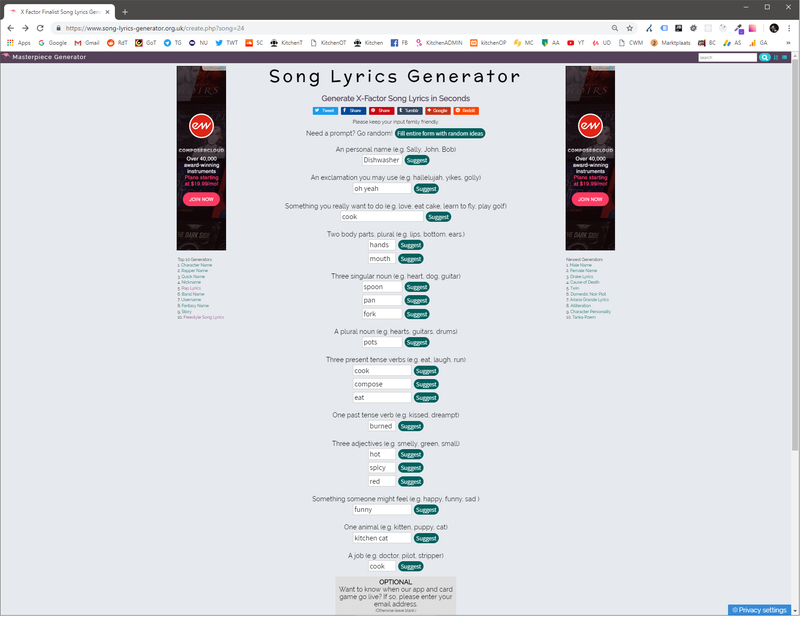 It was fun to play with computer generated lyrics, but it's not my thing. It WAS a nice experience though! I was a bit disappointed by the generators. They seem to be nothing more then a few templates, where the blanks are filled using the words you entered. I was hoping for some more artificial intelligence haha. I took the chance to play with new audio software as well, this time I used Reason 10.2, lots of fun to play with that synth rack! Blimey mate those lyrics are bleedin' awful. You done a grand job making such a decent song out of them. That line needs to be inducted into the Rock n Roll Hall Of Shame. Thankfully you didn't sing it. Yeah the song is well catchy in that forever teenage, synth pop way, and you do a real good vocal. Yes I could've danced to it, but the embarrassment it wouldve caused those around me persuaded me to keep still. Hahaha @eric craptone , yes they are awful!! I had a hard time getting inspired by that crap.. For me this was the hardest kitchen challenge so far.. Please dance my friend, I'll back you up!! Haha.. I hated 'I'm not here to say I'm a kitchen cat' most..
To cook is my goal "
I really like your melody! And how you sing it! You have also achieved a song that fits like a glove to the spirit of this forum, there is no way to cook-compose. It could be our motto! hi @Mar T. this sounds awesome! Dear @Mora Amaro La Loba , thank you so much and I'm glad to hear this track made you feel good! Haha, yes! Composing and cooking is what songwriting in a kitchen is all about!! Haha.. Joining this challenge was a weird thing to do, and I love weird stuff!! Btw, I consider your work 'weird' as well, so I love it!! ...haha this was fun to listen to! XD XD XD ...baffling lyrics - we confirm that you're 'here to cook'!! Hey @Mar T. this has a cool retro dance vibe! It looks you're having some fun with Reason …. I've always wanted to try that program but for some reason I never have. Somehow you just sold some unbelievably ridiculous lyrics with a very fine performance. Cheers @Rachel_D and @Bill from November Sound , haha, good to hear you enjoyed this attempt to write an X factor song.. lol! I had fun creating it as well! Yes Rachel, I'm here to cook AND compose, that's the only thing that's right here in those lyrics haha..
Bill, actually I'm really having fun with Reason, it's a complete different way of thinking with that synth rack one can build and even patch virtual cables in on the backside to route signals the way you want. They have a 30 day free trial version if you want to play with it.. Thanks for listening and commenting fellows! @Mar T. - very good! I missed this one until now... Liking the melody and build up a lot. You could easily rewrite some words and the song would be not out of place on public radio. The subtle vocoder vocals is way cool! @Mar T. That was awesome! Lol. I wanted to get out my red dress and a cocktail! Hehe cheers @oorlab , I must say I had fun with the challenge you came up with! And you did very well yourself! And I loved playing with all Reasons synths (and vocoder indeed)! Lol @Kellyanneg , I'll buy you a bloody marti then! Thanks for listening! @Mar T. - is that a hardware or software vocoder?If the latter, I sure like to have a look over your shoulder one day how you work such plugins. Retro pop, like Modern Talking. You even have a voice that they could have used. But let's admit it, every lyric is better than what they used to do, even yours - erm sorry, even that algorithm's. The tune is nice, dancy, and sweet like a lollipop. Would I blemish my credibility if I said I liked it? Truth is, I do. @Pleudoniem Haha I know your thoughts about these computer generated lyrics stuff, so I appreciate your listen! I'll never ever use a lyrics generator again, but I must say that all the crap that was generated actually had some humour in it. And I love having fun!